Donald Trump’s first 70 days in the Oval Office have been less than terrific. The president’s first major immigration policy was struck down by the courts, after accomplishing little beyond hurting America’s tourism industry and mobilizing the Democratic base. His health-care plan failed to garner a vote in the House — but succeeded in dramatically increasing the popularity of Obamacare. And his first national security adviser was forced out of the White House by a scandal that may threaten his entire administration. Meanwhile, House GOP leaders are publicly confessing that their party does not know how to govern; the threat of a government shutdown looms; rival factions in the White House leak embarrassing information on each other every other day; the Executive branch remains historically understaffed; and Gallup puts Trump’s approval rating at 36 percent — two points beneath Barack Obama’s lowest mark in the eight years of his presidency. The last time Trump’s prospects looked this bad, a libertarian billionaire (who believes the lives of his cats are worth more than those of the poor) threw millions of dollars at the mogul’s problems — and bought one of the greatest political comebacks in American history. Now, Robert Mercer’s family is looking to repeat that trick. 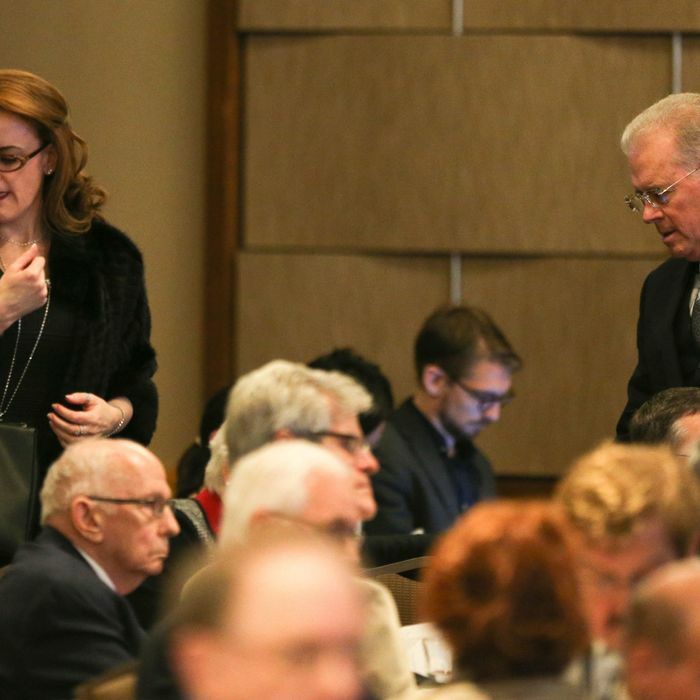 Making America Great, a nonprofit run by his daughter Rebekah Mercer, is launching a $1 million ad campaign aimed at putting the fear of 2018 into the hearts of in-cycle, red-state Democrats. Bloomberg reports that the ads will air in the District of Columbia, and in ten Trump states where a Democratic senator is up for reelection next year — West Virginia, Wisconsin, Missouri, Michigan, North Dakota, Florida, Ohio, Indiana, Montana, and Pennsylvania. In addition to the million the nonprofit is spending on television, it will put $300,000 into digital ads. Make America Great’s first spot highlights Trump’s historic accomplishments: The 298,000 jobs that the American economy created in his first month (before any of his policies went into effect), his decision to withdraw the U.S. from the Trans-Pacific Partnership (an effortless action, which Hillary Clinton had also promised to take), and his approval of the Keystone XL pipeline (which is expected to create 35 American jobs). By turning up the heat on Democratic senators, Trump’s backers hope to smooth Neil Gorsuch’s path to the Supreme Court, while coercing bipartisan support for the president’s upcoming plans on tax reform and infrastructure. Democrats are on a torrid fundraising pace in the first months of the Donald Trump era, powered by enraged small donors who are plowing millions of dollars worth of online contributions into campaign and committee treasuries … In February alone — and just online — Missouri Sen. Claire McCaskill, a top GOP target in 2018, brought in over $212,000 in donations of under $200 through ActBlue. That’s over four times as much as she raised in small donations across all platforms — online or through more traditional fundraising means — in the first quarter of 2011, the comparable period in her last reelection campaign. This groundswell of liberal largesse — combined with Trump’s deep unpopularity — could embolden red-state Democrats to toe the party line against the president. Especially since small-dollar donors are keen to reward national Democrats who reflect their outrage. For her stalwart opposition to Trump’s cabinet nominees, such donors gave Kirsten Gillibrand $637,000 in small-dollar, online contributions last month — over six times more than she received in the first quarter of 2011. And liberals are opening their wallets for down-ballot candidates, too. Democrat Jon Ossoff’s bid to win a historically Republican House seat in Georgia, which was just vacated by Tom Price, raised nearly $2.1 million online last month — more than Price spent over the course of his entire 2016 campaign. This mobilization of online donors couldn’t come at a better time for Democrats. With unified Republican control in Washington, the lion’s share of corporate bribes (a.k.a. campaign contributions) are likely headed to GOP coffers. And after the donkey party’s big-dollar donors squandered a fortune on Hillary Clinton’s failed presidential bid, many are loath to put more skin in the game, at least for the moment. All of which is to say: The Democrats are growing increasingly reliant on the small-dollar donations of ordinary, left-leaning Americans, while a beleaguered White House is becoming increasingly dependent on billionaire money to insulate it against the unpopularity of its reactionary agenda. For progressives who wish to polarize American politics around issues of class and corporate power, this seems like an encouraging development.